Of course, the band are acutely aware of the significance of the record and have trodden carefully. A few minor tweaks aside, it’s essentially a carbon copy of the original in terms of the arrangements. Every riff, orchestra hit and dive-bomb is unchanged and in its rightful place, so you diehards can breathe easy: no major crimes have been committed. Sonically though, the album is supercharged: the guitars are crunchier, the keyboards are chunkier and the drums pound harder. This won’t be to everyone’s taste of course - part of the charm of the mid-eighties rock is in the thin, reverb-drenched production of the time - but the result is a record that’s brimming with energy, clarity and punch. This is no mean feat, as there is plenty of pep in the original release but this modern sound, while arguably less nuanced, suits the digital listening age and sees the material conforming to more current production trends. One of the most striking things to note is in the lead vocals: Steve Overland’s voice has weathered phenomenally well. Although many of the tracks here are in a lower key - which contributes to a darker, tougher sound - it’s practically impossible to make a distinction between the Overland of 1986 and 2016. This is a boast that almost none of the frontman’s contemporaries can make. Oddly, FM are probably better acquainted with their early material now than they ever were in the past. Since the band regrouped in 2007 they have been virtually non-stop both in the studio and on stage. As part of their apparently never-ending tour they played three Indiscreet 25th anniversary shows in 2011 where they performed the record in its entirety for the first time. This has doubtless served them well in the making of Indiscreet 30, which has clearly been nothing other than a labour of love for the band. The great diligence taken over the detail and reverence with which they’ve approached the songs goes a long way to making the record deliciously enjoyable for fans of the original release. From the unmistakeable computer noises (all hail original keyboard player Didge Digital) that open the mighty ‘That Girl’, through the stabbing pomp keys of ‘I Belong To The Night’ on to the Survivor-infused ‘American Girls’ and mega-ballad ‘Frozen Heart’, the magic of this great set of songs is all still there. The seven bonus tracks are a really mixed bag: there's a noodly acoustic rendition of 'That Girl'; a new ‘original’ version of the huge Ozzy Osbourne hit ‘Shot In The Dark’ (taken from 2012’s Only Foolin' EP) which is of historical importance to the band (Steve and Chris Overland have never received credit for the track despite having co-written the song with Phil Soussan way back in their pre-FM days in the band Wildlife) and 'Let Love Be The Leader', a new recording of an archive track, likewise in keeping with the Indiscreet era. The band have chosen to add more recent material too, I guess to introduce fans of yore to the sound of present-day FM. So, also included is the brand new song 'Running On Empty'; hard rocking 'Love & Hate'; the feelgood 'Bad That's Good In You' (from the 2014 Futurama EP) and the Bryan Adams-influenced ‘Rainbow’s End’ which blends the band’s melodic sense with the soul/blues sound they cultivated in the early 90s. Indiscreet was only recently given the smart Rock Candy reissue treatment but some new liner notes for this release would have been really nice. Just a little something more than the perfunctory track listing and writing/production credits would seem in order, given the calibre of the music FM made then and have lovingly recreated now. That, and the slightly random nature of the bonus tracks, is my only real complaint. 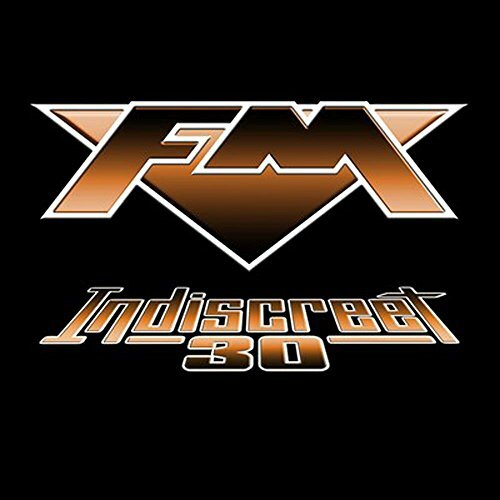 Indiscreet was a very big deal in 1986 (it secured them a support on the UK leg of Bon Jovi’s Slippery When Wet tour after all) and FM have brought it up to date, thirty years on, in a most respectful and quite delectable way.